This silk scarf, created by Nia Fliam, is a piece of contemporary wearable art that pays tribute to the Javanese batik tradition. I first saw Nia Fliam's artistry when a friend traveling through Asia e-mailed me some quick snap-shots of her scarves. I instantly fell in love with the colors and designs, so I gave the go-ahead to purchase the lot of them. When my friend finally got home and I received the scarves I found the batik to be more exceptional, and the colors to be even more vivid than I'd dared hope. Rest assured that I did my usual homework before including Nia's scarves in the VirtuArte collection. Her studio (Brahma Tirta Sari) borrows techniques and aesthetics from traditional Javanese batik and Kejawen philosophies to create their works of art. The studio, shared with her husband, Agus Ismoyo, houses over twenty five artisans who work collaboratively to design and create every piece, such as this scarf. 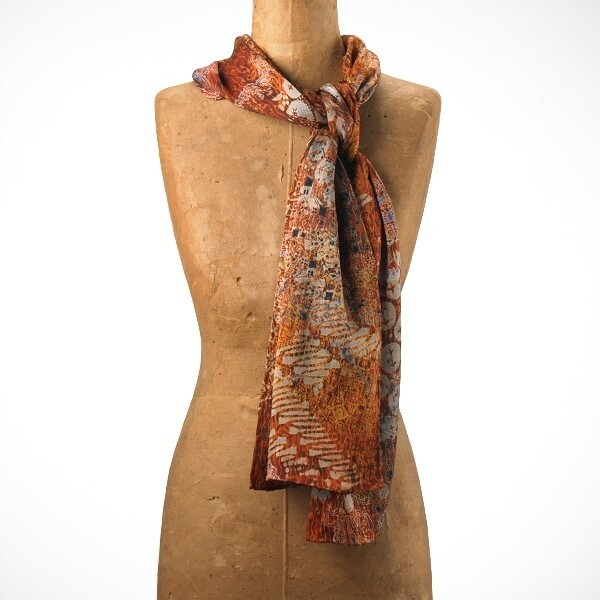 This batik scarf is created through the use of a manual wax-resist dyeing technique, making it one of a kind.